ATLAS Copco Compressors has added three new small heatless desiccant dryers to its existing range of 17 larger models. The three new units, which range from 2L/s to 5L/s, incorporate desiccant cartridges that include an integrated dust filter. They are also equipped with an electronic controller that has the potential for remote monitoring. 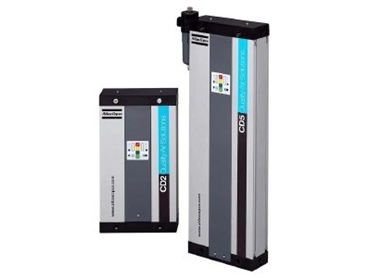 Such features, according to Atlas Copco, make the new CD2-5 particularly suitable for point of use and OEM applications. The new units have a very small footprint and offer high flexibility, as they can be installed either vertically or horizontally depending on the available space. The multi-port inlet and outlet, and integrated after-filtration, have also been incorporated to keep space to a minimum. An electronic timer controller provides remote monitoring and purge cycle pause (via a remote signal) as standard. Additionally, all units include a series of interchangeable purge nozzles so, whatever the operating conditions, the best nozzle can be chosen for optimum performance. The aluminium profiles are anodised to prevent corrosion and the molecular sieve desiccant ensures a reliable pressure dew point down to a minimum of -70ºC. Routine maintenance of the models is fast and easy. Changing the desiccant and integrated filters takes just a few moments. Both are integrated into a consumable cartridge (two per dryer) that can be removed and replaced without disconnecting the dryer from the pipe system. The new additions to the range ensure Atlas Copco provides more than just air compressors - every customer is provided with a complete compressed air solution backed up by a global aftermarket support structure.